Adrian sul’Han, known by the nickname Ash, is a powerful healer who wants revenge. After being forced into hiding after a series of murders throws the queendom into chaos, Ash went into training for healing. During his summer’s off, he would exact revenge on the important political figures of Arden, but he’s come to realize that small moves aren’t enough. So he makes the move to Arden, determined to get his revenge on the king of Arden himself. However, the assassination is a little bit harder than he’s counted on. Meanwhile, Jenna Bandelow is living in Delphi, where the king of Arden has ordered everyone work in the mines. Jenna’s been working in them since she was a child, until her best friend was murdered by the king himself, and she was assumed dead in the ensuing struggle. Since then, Jenna’s been striking back, blowing up mines and bridges and making life harder for the king’s men. But Jenna has a mysterious magemark on the back of her neck, and it’s made her a target. She is only able to hide for so long before she’s dragged to Arden by the king’s men, where her path collides with Ash’s. I’ve read Cinda Williams Chima’s Warrior Heir, but Flamecaster goes above and beyond what I’ve read so far from Chima. I have not read any of the other Seven Realms novels, and that did not hinder my reading. 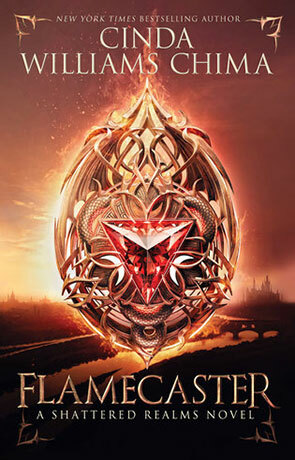 Flamecaster is thrilling, enchanting, well-written, and packed with adventure. Most impressively, Chima has crafted a believable fantasy world embroiled in politics, even down to the little details. It took a bit for me to really get into the book, however. At the very beginning, there’s a death that I found cliched and frustrating, and as I read on, I thought I was going to wind up continued annoyed with cliches. However, Flamecaster redeems itself. I enjoyed the complexity of the characters (I found myself really liking Destin, despite that he works for the enemy). The characters’ flaws and mistakes make them that much more realistic and enjoyable, though I have my personal favorites (Lila and Destin—what can I say, I like my characters in the gray area of good and evil). The plot was fairly predictable, but there were some great few twists and turns thrown in at the end. I loved the well-thought out elements of magic and fantasy, especially Jenna’s storyline, which leaves a lot of unanswered questions (in a good way—because now I need the second book). What is the magemark on the back of her neck? No one seems to know what it is, though it has most certainly marked her for danger and it gives her certain abilities. Why does she have certain abilities, and why is an empress willing to trade an army for her? My complaints are few—the opening scene was irritating (just get past it, it’s worth it), and I didn’t feel like Ash and Jenna’s romance was as fleshed out as it could have been. It wasn’t cheesy or annoying, and despite that I liked those two characters together, I found myself unimpressed with the quickness of their romance. I almost would have preferred to see Ash with Lila, who is a much more interesting character (not in terms of mystery—Jenna has a lot of intriguing mystery surrounding her—but I find Lila to be much more complex). I also knew that Ash and Jenna would get together as soon as they were both introduced in the novel (before they were even in the same city), so I wasn’t remotely surprised at their romance. Regardless of a few tired tropes present in Flamecaster, I loved the novel and I am eagerly awaiting the second in the series. The twisting plot, well-built world, and intriguing characters made this book a huge win for me. Written on 11th March 2016 by Vanessa.